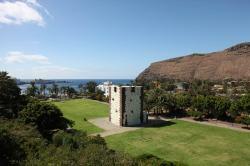 Discover the El Conde Tower in San Sebastián de La Gomera. The Torre Del Conde (Conde Tower) is located in the municipality of San Sebastián de La Gomera on the island of La Gomera, very close to the port and the San Sebastián Beach. The El Conde Tower is a fortress built in 1450. Nowadays this is the most important military canary architecture edification still standing and that’s why its considered a symbol of La Gomera as well as Historic Monument. The Torre del Conde is a gothic style tower, with square shape mostly used to resist the people’s riots as well as to prevent english and dutch’s attacks. Nowadays the El Conde Tower is part of a park. In its interior you might take a look at a historic mapping exhibition from La Gomera although for many centuries the only thing around was water from its bay. Monday to Friday from 9am till 1pm and from 4pm till 6pm.